Online advertising is a type of promotion that uses the Internet and World Wide Web to deliver marketing messages to attract customers. It has become one of the most sought after medium, as this model is highly targeted to audience, low on cost, not limited by geography and enables effective tracking. 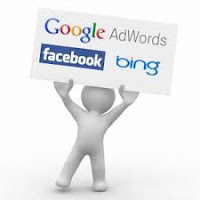 In this post, we’ll be primarily focusing on Google AdWords, Facebook Advertising, Yahoo! Advertising Solutions, Microsoft adCenter. Adwords, Microsoft adCenter and Yahoo! Advertising have similar kind of advertising solutions. Yahoo! has joined hands with adCenter in order to cater to search marketing. But, Facebook is very much different from all of the above when it comes to Pay Per Click advertising. Basically, in search engines users are actively searching for a solution. But, in Facebook the primary purpose is to socialize. Thus, advertising on Facebook should basically concentrate on building relationship rather than converting into sell. Facebook advertising is also great for creating brand awareness. In case of AdWords and adCenter there is more probability of selling conversion in comparison to Facebook advertising. AdWords has more reach to users because of high search volume of Google and very large number of publishers who bolster the Google Display Network. Facebook, adCenter and Yahoo Adverting lag behind Google Adwords when it comes to reaching large number of audience. Only Adwords and Yahoo! Advertising Solutions provide wide array of ad formats (text ad, image ad, rich media, video ad, banner ad). The ads offered through AdWords can have large variety of dimensions in comparison to other solution. Yahoo advertising has gone one step further by proving dedicated audience buying service (Genome), interactive video ads, clickable video ad and interactive TV broadcast ads along with all the ad formats given by Google AdWords. Microsoft adCenter targeting feature lets advertisers use specific data – like user location, days of the week they search on – to target set groups of people. This is excellent news in terms of marketing as the result is a highly customised PPC campaign that may lead to a high return on investment. Google provides most comprehensive tools for market research and conversion tracking. Google Analytics, Google Hot Trends, Google Adwords Tool (for keyword volume, estimation) are some of the tools than can provide deep insight into advertising campaign tracking. Facebook were to provide data around likes, shares, and keyword targeting in status updates and comments, they could provide research tools and targeting that could surpass that of AdWords. Given below is a chart of market share by ZenithOptimedia. Taking into consideration of the above parameters along with target audience and marketing tactics a product or service should be promoted through one or combination of advertising solutions.